On December 5, 1933, something significant happened which continues to affect the lives of millions of people around the world today: the prohibition of alcohol ended. Alcohol began flowing throughout the country, and eventually became the most widely used mind-altering substance known to man. Delicious, numbing intoxication continues to hold a deadly grip on millions of people around the world. After some time, science proved that alcohol was a killer: with enough use over the years, booze could cause cancer, heart problems, and many more. Despite this, many people still demonize cannabis and say that it’s more harmful than alcohol. If you’ve ever gotten drunk (who hasn’t! ), you know exactly what it’s like. There are the black outs, vomiting, and feeling horrific the next day. If you’ve ever been on the receiving end of an aggressive drunk, then you know just how bad booze can make a person. Drunks are also hazardous to other people, especially heavy drinkers. In the Untied States alone, some 30 people die each day from car crashes caused by drunk driving. Alcohol claims around 10,000 lives every year on the road. That’s not even counting the people that have died from alcohol-related diseases – that’s 88,000 people a year. On the other hand, people are generally chilled out and calm when stoned. Cannabis is known for its powerful relaxing properties, and it’s a safe, natural social lubricant that can be used in place of booze without worrying about side effects. Sure, it isn’t a good idea to drive when you’re high, but once the hit wears off, it’s fine. Better yet, stick to CBD if you know you need to drive. Excessive alcohol consumption leads to violence and crime. Drinking too much can easily lower your inhibitions, impair judgment, and it increases the risk for destructive behavior. Data shows that binge or prolonged drinking greatly increases the risk for committing a violent offense, and if you give in to it, your entire life can change instantly. When you commit crimes or violent behavior because you’re drunk, you are not only jeopardizing your life, but those of other people too. Criminal behavior can put you in jail, and will cost you in legal fees. Is it really worth it? Common alcohol-related crimes include driving under the influence, robbery, homicide, assault, property crime, and many more. Alcohol use has also been linked to domestic violence. Partner violence and child abuse can occur in a home where one person is constantly drinking excessively. Children who grow up in homes where a parent or loved one has an alcohol addiction or disorder can also suffer serious consequences, and they also have a higher risk for developing an alcohol use disorder later in life. Additionally, kids who grow up in a home where serious alcohol use disorder is manifested by one or both parents can also expose the child to emotional and psychological problems that are difficult to treat. On the other hand, cannabis use has been associated with a reduction in domestic violence. Cannabis just makes people more placid, and it hasn’t been tied to any kind of crime. Over 15 million people in the United States have some form of alcohol use disorder. An estimated 65 million adults admit to binge-drinking each month. It’s too easy to get hooked on the mind and emotion-numbing effects of alcohol, especially if you need an outlet for stress. All you need is an ID to prove that you are of legal age, and you can drink as much as you want without a limit. Cannabis is not addictive, yet so many people still struggle with accessing the drug. Those who live in legal states have to comply with purchase and grow limits which is downright ridiculous. The lethal dose of cannabis is 1:20,000, which means that you would need to consume 1,500 pounds of pot within 15 minutes. You can try to smoke that much weed, and you’ll probably have fun trying but there’s no way you can die from smoking pot in ANY amount. You might feel like you’re dying if you eat too many edibles, but you’ll be fine in a few hours. Regulating cannabis like alcohol is a great idea, but comparing the two is a crazy idea. Responsible alcohol use is acceptable, but if you can’t handle your whiskey, you’re a bigger threat to society than anyone who’s stoned. 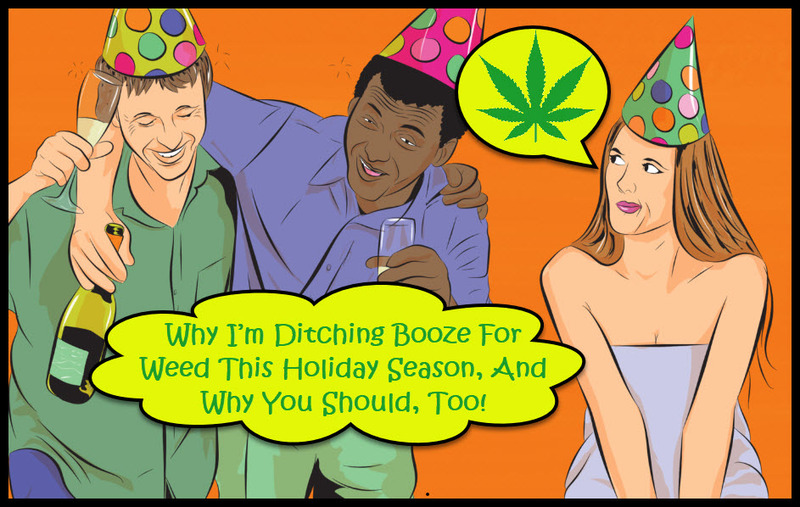 5 REASONS TO GIVE UP BOOZE FOR WEED, CLICK HERE. 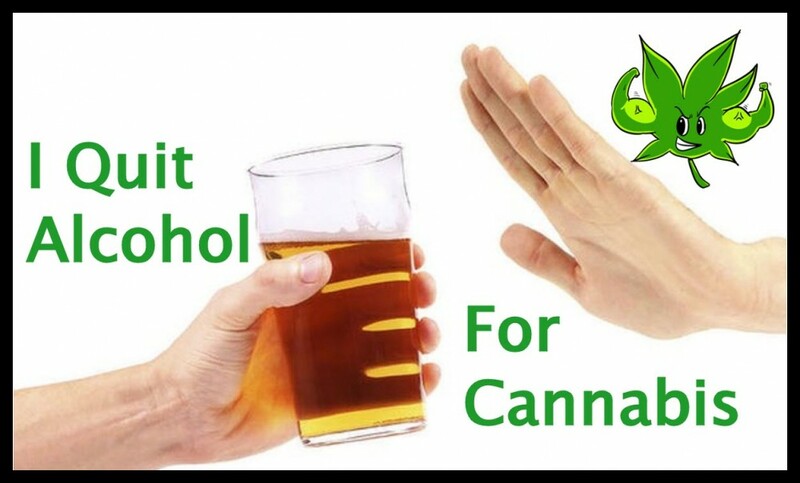 I QUIT ALCOHOL FOR CANNABIS, CLICK HERE. 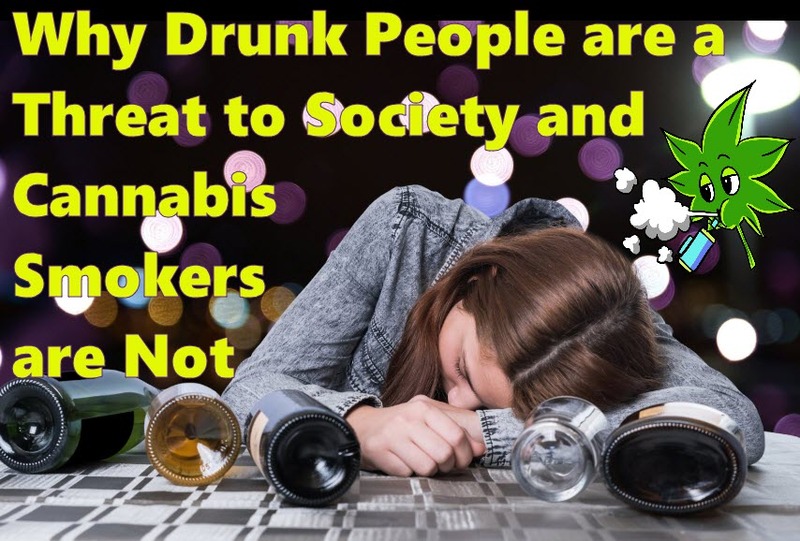 Cannabis, drunk, People, Smokers, society, Threat. Bookmark.